Why do you want to quit? Do you just hate nursing all together or you hate your present environment? 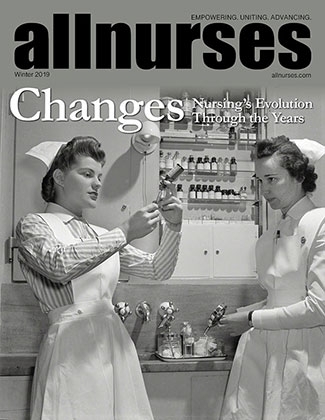 There are a plethora of opportunities now for nurses. I have friends working in the schools, corporate America, even the FBI. In my state, LPN's can only work in Long term care. I would suggest that you get a refresher as things change so much in today's times. Technology, especially the EMR can be a daunting process to learn. Also, long term care regulations are changing daily. You might be able to secure a position in an LTC facility as an EMR administrator since you have that background in Information systems. Good luck! Wait- when you say briefs you mean diapers? Are you saying the residents are only "allowed" to be incontinent 1-2 times a shift? I don't know if it is against the law, but it sure is unethical. I noticed your username is missing a P. Is this on purpose or was it a mistake? Are you aware that you can change your username in Account Settings? Thank you! I was not aware of this! There are a plethora of choices for nurses nowadays. I have nurse friends who work in the insurance industry, the school system, corporate America, home health, etc. What do you like? Congrats on your job! I was an NA in nursing school and it was the best experience. Of course, during that time, we did not have EMR's! Enjoy your new job and don't worry about the documentation. This a skill that will come to you eventually. Save yourself; get out of medicine. I am sorry you have had those experiences in nursing. Maybe nursing is not for you? And that is ok. It does not mean that you are a failure. I absolutely love bedside nursing. I have been a bedside nurse for almost 30 years. I have an MSN in Informatics and I can't force myself to leave the bedside! There were two incidences. One was for forgery and yes those nurses should be held accountable. However, the second was the patient got septic because of an infected wound. In this incident, there is much blame to go around. Why should "just" the nurses go to jail? If the patient's wounds were so necrotic that the patient went into septic shock, this did not happen overnight. Doctors are paid a nice salary to oversee these patients most likely by CMS. The providers did not look at the necrotic wound? The providers did not ask for debridements? The patient's labs did not show an infection? The wounds were not ordered to be cultured? Is no one monitoring the patient's vital signs? I am not protecting other nurses when they are clearly wrong. There were 100,000 deaths due to medical mistakes last year according to CMS. No doctors are being hauled off to jail and no one is calling for doctors to be hauled off to jail. Usually, when these sentinel events occur, it is a systems process error. I can't go along with just the "nurses" are responsible. So wouldn't you agree that there should be more charges brought besides the nurses? Thank you! Will do !! Thanks for he follow !!!! Staff Nurses are not responsible for writing orders for wound care. Period.